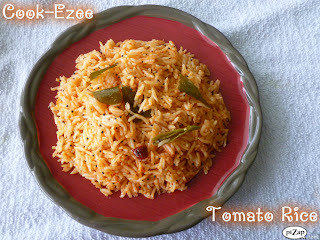 Tomato rice is a popular rice item made with sauteed spices and tomatoes, added to the boiled rice. Many people prefer to make it because of its easiness to make and moreover the leftover rice gets a very good makeover and results to be another yummy dish on your dining table. Here I'm adding another version of tomato rice which is very yummy and ezee recipe where you do not have to make the rice in advance. This is my way of making it on busy mornings for my hubby's tiffin, by the time you make some quick breakfast the pressure cooker will take care of your tomato rice. Smart option for working women as well, so friends give it a try and add this in your recipe bank of ezee cooking. Enjoy!!!!! Wash well and drain the rice. Set aside. Puree the tomato in a mixer, pour into the measuring cup(the one you took for measuring rice) and check for the quantity. Heat up the pressure cooker, pour oil, crackle the mustard seeds, add urad dal, chana dal, curry leaves, dry red chilly, chopped ginger, green chilly and saute for a minute or two. Pour the puree, add the asefoetida and bring to boil. Let the cooker cool completely and move to the serving dish. Serve warm with plain yogurt, raita, pickle or any curry if desired. Enjoy!! !